A Connecticut lawsuit filed in mid-August accusing Poland Spring of being “common ground water” instead of spring water seems to have sent the bottled water brand to its lowest consumer perception level in more than six years, according to YouGov BrandIndex. However, the suit, which is still seeking class-action status, seems to have barely impacted potential sales so far. 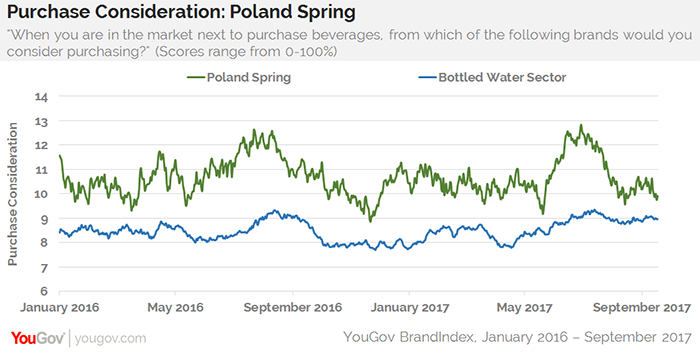 According to Poland Spring’s Purchase Consideration score, YouGov BrandIndex’s measurement of potential sales revenue, 10% of consumers would consider buying Poland Spring the next time they want to purchase bottled water, just one percentage point below the same time last year. In January 2011, the Environmental Working Group (EWG) issued a report about the bottled water industry and gave Poland Spring a “D” grade for its lack of disclosure on its labels. 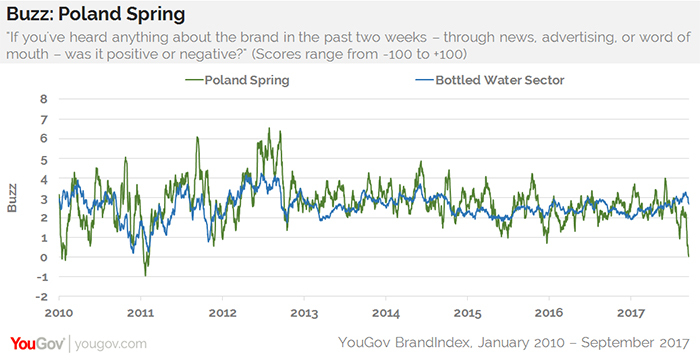 In determining consumer perception levels, YouGov BrandIndex measured Poland Spring with its Buzz score, which asks respondents: "If you've heard anything about the brand in the past two weeks – through news, advertising, or word of mouth – was it positive or negative?"